The first recipe of the week as requested by my friend RyH who wants my cooking across a Provence. ok first I'll explain the basics and then give other options to add to the meal. Basic meat and potato casserole as made by me when I'm lazy. First fry the ground beef on medium until no longer pink, keep stirring or it will burn on. Add salt and pepper to taste (a few shakes). Chop up your onion thinly and mix with the mushroom soup and roughly 3/4 cup of water. Then mix in 3/4 of the mixture with the beef. Add this beef mix to the casserole dish. Peel the potatoes and slice them. 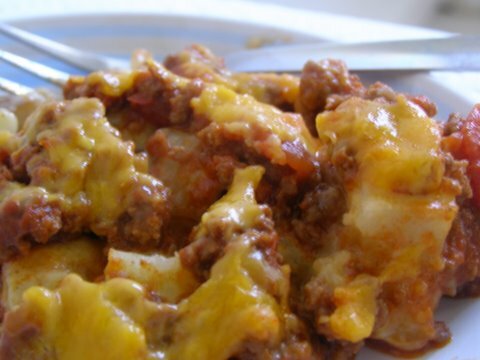 Mix the potato slices with some mushroom and onion mix then add them to top of the casserole. an even layer is preferred. There should be enough for 4 people. - you can add garlic to the mix or use garlic salt instead of regular salt. - most veggies chopped can be added experiment with taste. -you can use different types of onion to gain slightly different flavors. -after completing the basics there are literally hundreds of new combinations to experiment with. you can still make the cream of mushroom soup.